The zombies within the library already converged on the pair. Arms and fingers clawed at them like horrors erupting from a grave. Since all their guns had emptied, there was little Devon and Emily could do other than bash through the undead’s ranks swinging wildly as they went. Devon’s machete led the way, while Emily struggled to keep their snapping jaws away by using her rifle as a club. Dells, Becca, and Fosters, had cleared a space and held their own under the area where the ramp to the upper level had broken away. “Looks like Haeds must have dynamited the ramp,” Devon panted, as he broke through the last few zombies into the relative safety of where their new allies stood. “No kidding,” Dells yelled, as he tipped the large library tables onto their side. Fosters rushed over and together the two men lifted Emily toward the jagged edge of the upper level. Her fingers grabbed at a chuck of cement, but it came off in her hand sending dust into Devon’s upturned face. He cursed, but couldn’t spare a hand to wipe the grit free. Behind him, the moans of the zombies grew louder. A zombie had a fistful of his jacket and pulled Devon backward. “Emily grab on!” He managed to get out as a tugging forced him to let go. He watched Fosters struggling, but then he felt his neck being pulled toward a snapping mouth. He went with the pull, but spun and brought his elbow into the corpse as hard as he could. The zombie lost its grip on his jacket, but there were three more shambling teenager corpses behind the first one and he was yards from here he had placed his machete. Going low, he kicked the one he had just fought in the solar plexus. It fell over taking another one with it. A thick wooden chair quickly filled his hands. One took a chair leg to the temple. Devon gave him a second smash, harder this time and no one was more surprised than him when the blow caved in the Zombie’s skull. Lucky for me, these Walkers are getting old. 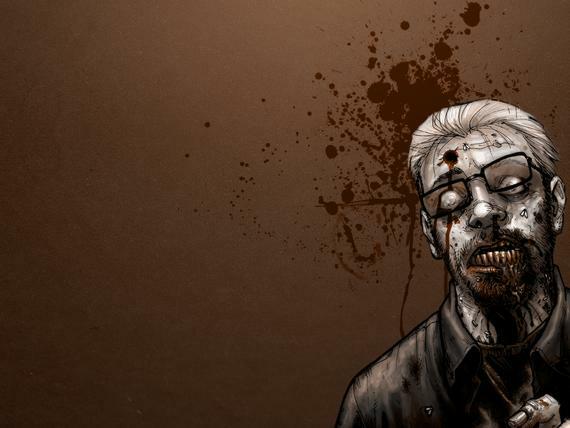 The last zombie had the chair heaved at his legs, which sent him stumbling over a pile of spilled books. But dozens more gathered in the library and would be at them in moments. Dells and Becca were already engaging the second wave of undead. A hundred had to be within the library. Devon hacked down the one he had elbowed in the throat and shouted. “Fosters, go. Grab a gun and get busy.” The teacher scrambled up the ladder in frantic haste. Devon hacked the one on the book pile before it could regain its feet and then a second was put out of its misery. He had a small reprieve, but it wouldn’t last long. He toppled over two book cases and started to heave chairs into the approaching horde. Dells retreated until he and Devon fought back to back. Becca threw them a look and started up the ladder. She was behind them. She should have been safe, but a girl dressed in a black stained cheerleader outfit led a group that had circled around the book stacks and came at them from behind. A horrid scream stunned the two men, but it was already too late. The pain of the bite had caused Becca ‘s grip to weaken and the three zombies pulled her off the rope ladder. In what could be considered a merciful turn of fate, her head connected with a bookcase and she was unconscious, if not dead, before she hit the floor. With an angry nod, he threw his bat into the face of the closest zombie and then started up the ladder. Devon guarded his back, but between their walls, the well placed shots from above, and the gruesome feast at his feet, Devon made it up the ladder before the horde could grab him. He gave one last look at Becca’s body painting the floor in ugly red strips, tucked his machete through his belt, and climbed over the lip onto the second floor.